Sociology has tackled some of the most formidable problems that confront contemporary society: inequality, homelessness, violence, gender, and many more. Sociologists assert that hypotheses can be formulated and tested against empirical evidence, that faulty viewpoints can be uncovered and discarded, and that plausible theory can be distinguished from mere ideology. This collection was written over a span of forty-four years and is presented in the belief that sociology is a science. In Social Problems, Social Issues, Social Science, James D. Wright presents his research on some of the social issues that have most vexed America: homelessness, addiction, divorce, minimum wage, and gun control, among others. 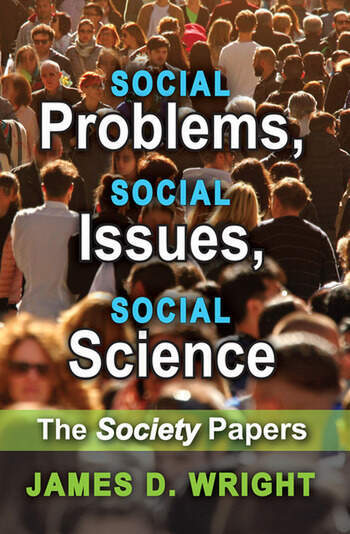 Starting with essays first published in the flagship journal Society, Wright offers readers a foundational look at specific social problems and the methods sociologists have used to study them. He then provides an up-to-date re-examination of each issue, analysing the changes that have occurred over time and how sociologists have responded to it. This book is both a retrospective on the field and on one scholar's life and work. Using his own experience in researching and writing about America's most trenchant social issues, Wright describes the evolution of the methods and theory used by social scientists to understand and, ultimately, to confront America's most troublesome social problems. Preface: "Nor Commit a Social Science . . . "
"Life, Time, and the Fortunes of War"
"The Worthy and Unworthy Homeless"
"Address Unknown: Homelessness inContemporary America"
"Ten Essential Observations on Guns in America"
"Kids, Guns and Killing Fields"
They've Got Nothing to Lose"
"Small Towns, Mass Society, and the 21st Century"
"Sobering Up on the Streets"
"How Can We Stay Sober"
Self Fulfillment in a World Turned Upside Down"
Wayne LaPierre, "Guns, Crime, and Freedom"
Quarter Circle in the 1920s"